Does it seem like all I eat is rice? Well, sometimes I cook outside the box (get it, a box of rice?! ), but I just think that brown rice is the most versatile and easy to use ingredient, especially for gluten-free peeps, so I turn to it all the time. I can make Asian, Mexican, Italian, and Greek dishes - you name it, brown rice absorbs all the flavors and serves as a great base for lots of different recipes. Last night was pea and mushroom risotto and it was delicious and oh so simple. We had it with sauteed chicken breasts and broccoli. Enjoy and have a fab weekend! In a large pot, heat 2 cups of chicken broth until boiling. Add rice and return broth to a boil. Reduce heat to medium-low and continue to cook, adding splashes of broth as the rice absorbs it, until you have 1/2 cup of broth remaining. In a pan, heat olive oil over medium heat. Add sliced mushrooms and sauté until brown and soft. Set aside. 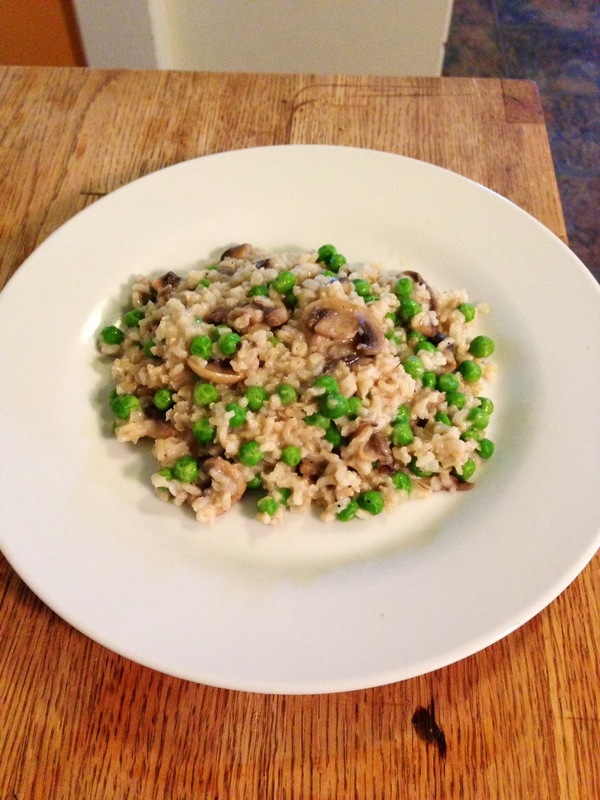 When the rice is cooked and most of the liquid is absorbed, add mushrooms, frozen peas, and remaining 1/2 cup of broth. Cover and cook until peas are defrosted. Stir in Parmesan, salt, pepper, garlic powder, and onion powder, and serve.